· Next-Gen WiFi Standard - 802.11ax WiFi standard for better efficiency and throughput. · Ultrafast WiFi Speed - 6000Mbps WiFi speed to handle even the busiest network with ease. · Wider Usage and More Convenience - 4 antennas + 8 LAN ports to support more clients at the same time. · Commercial-grade Security - AiProtection Pro, powered by Trend Micro™, blocks internet security threats for all your connected smart devices. · Better Partner with Mesh System - Compatible with ASUS AiMesh WiFi system for seamless whole-home coverage. RT-AX88U's Adaptive QoS prioritizes game packets for smoother online play. It also has built-in wtfast® to seek out and secure the shortest possible path between your gaming device and the game server, minimizing game ping and lag2. 2 The free router edition supports one selectable device on your network at a time with GPN traffic limits, and includes wtfast® technical support. Users can pay to upgrade to the advanced version for simultaneous acceleration of multiple devices with more GPN traffic and advanced features. Check out supported games list here. * To benefit from 802.11ax features, the Wi-Fi client needs to be 802.11ax capable. ** Actual data throughput and WiFi coverage will vary from network conditions and environmental factors, including the volume of network traffic, building material and construction, and network overhead, result in lower actual data throughput and wireless coverage. *** Quoted network speeds and bandwidth based on current IEEE 802.11ax specifications. Actual performance may be affected by network and service provider factors, interface type, and other conditions. Connected devices must be 802.11ax-compatible for best results. 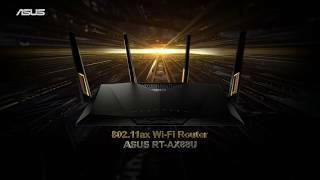 More links for "RT-AX88U AX6000 Dual Band 802.11ax Wi-Fi 6 Gaming Router"